How ’bout them Red Sox? How ’bout them Braves? Yes, you would be correct in noting my interest in baseball’s playoff push and absolutely crazy falls from glory of the Boston Red Sox and the Atlanta Braves. It has been a wild month, and for good reasons. Baseball is perhaps the sport where momentum in the moment matters the least. Good teams rarely find themselves in long ruts (unless you were the Pittsburgh Pirates after the all-star break losing 11 in a row). Bad teams may have a good week or two, but rarely put together good months or good long stretches. Baseball teams are built for long seasons and consistency, not catching fire during one stretch. That’s what makes this postseason run by these two teams so unbelievable. Both teams were built to last, to be consistent. The Braves were more or less consistent until this last month. But the Red Sox? They started the season dreadful with many Red Sox fans wondering if the team would win 80 games, let alone make the playoffs and World Series (they started 0-5 and I think 2-11). After that, the Red Sox were unbelievably white hot and looked like one of the best if not the best team in baseball. But it is important to remember that they have had their ups and downs. But up 9 games with a month to play? When baseball teams are built for consistently good play with great players like the Red Sox (mostly a deadly lineup with Gonazles, Pedroia, Ellsbury, Ortiz, and Crawford with a couple top notch starters) and Braves (mostly starting pitching like Jurrjens, Hanson, Hudson and Kimbrel but with solid offensive players too), you expect them to find their way after a down stretch. And they never did. They never recovered and never found consistent play throughout September. The lack of consistency for the Red Sox was seen in their losses, where there were days where they scored runs but couldn’t close games with Papelbon and Bard, or days when their offense couldn’t score at all. The Braves mostly couldn’t score but also ran into trouble because their bullpen couldn’t close games after all the innings they pitched. But the September collapses are both collapses and accomplishments. The St. Louis Cardinals and the Tampa Bay Rays were consistent this year. Now they were phenomenal in the month of September, but they consistently plugged all year long and put themselves in a position where a couple of good weeks would give them a shot. I love Albert Pujols, who got himself back in MVP consideration (though it should be Matt Kemp’s) with his hard work and focus in spite of a terrible month. The Cardinals withstood injuries galore and just played as well as they could every month. The Rays were the same and had that gritty style of play even though they aren’t significantly deep or pitching stout (after James Shields and David Price). But both those teams accomplished something because they called for consistency and all year long played consistently. Great months where teams play out of their minds are there for the taking, but bad months are avoided. I love these two teams and what they bring to the table. And they both bring playoff experience and moxie- and they deserve to credited for their comebacks, grittiness, and consistency- and perhaps I need to add confidence because the Red Sox and Braves played without it with empty facial expressions and odd mistakes. As an Angels fan, I remember our prodigious collapse back in ’95 when the Mariners made us look like fools and then in an extra playoff game Randy Johnson scared the crap out of us in the Kingdome. It is painful to be a fan of that team but it is part of sports- because with a collapse comes teams that played well and did their part. But it was an exciting run though. My eyes were glued to whatever I could watch and I loved watching the baseball last night. It only leads to a great postseason- I expect great things from the Phillies and their Trio of starters (Roy Halladay, Cliff Lee, Cole Hamels). I expect great things from the well built Texas Rangers. I hope Detroit has a magical run in them with the vaunted Justin Verlander and Miguel Cabrera. And what about the continuing magic from Tampa Bay and St. Louis (I am hoping to see Pujols bust out big in the playoffs)? And maybe even some surprises like Arizona? And what about the awesomeness of Ryan Braun and Prince Fielder in Milwaukee- that is a difficult matchup for any Arizona pitcher. World Series: New York vs. Philadelphia —- Philadelphia 4 games to 2. I can’t pick against the trio of starters in Philadelphia- they are so good, so consistent, so tested and unfazed. Texas is a sleeper and could get to the World Series, but I don’t think they have a shot at the Phils. My preferred World Series matchup would be St. Louis/Philadephia and Detroit, but I don’t think that is going to happen. Those are my thoughts? Who is your favorite? What are your picks? For your information, I have been reading a book called “The Moral Underground: How Ordinary Americans Subvert an Unfair Economy” recently and I will write a post on it as soon as I give it the reflection it is due. It’s worth a read because our economy really puts the poor, marginalized, and lower classes in difficult spots with work, family, health and education. It is has come down. The possible job at Texas Children’s Hospital has passed and the other candidate for it was hired (and I wish that candidate and Texas Children’s very well in their future!). I had so much hope in this job opportunity. Hope to get settled in an apartment or rented house soon. Hope to pay off a loan or a credit card quickly and start saving money for other things. Hope to be at the same church, Southwest Central CofC, that I love and care for so much. Hope that I will find a job that will bring a lot of meaning to my life. Hope to have finances settled for a while. Hope to be a part of a department of chaplains and close to chaplain friends at Memorial Hermann who are so valuable to my growth as a human being and chaplain. But it was not to be. And now, my world seems very uncertain. Where will I be for the next couple months? When will I get hired and how soon and where? Will I be working in hospital or hospice? Will I wait for something in Houston and commit to my church or will I commit to Southern Cal with my family and friends so close by? What will I do in the meantime- work odd jobs at convenience stores like Target or Academy or work PRN chaplain jobs to fill the wallet as I need? How long can I wait? How long should I wait? Oh the questions to be answered. And there is the issue of trusting God. I wrote not too long ago in a post that I did a silent retreat and often found myself seeing the beauty of trusting in God. And that is true. Does trusting God mean staying in Houston or moving to SoCal? Does trusting God just mean I should wait on a hospital job or try to get into a hospice job just to make the end’s meet? Trust God. Trust God. Trust God in the silence because I will be okay, God will not let me be shaken no matter how long the unemployment or how difficult the times. And those are so true. But this is a time where I feel a little lost and could use guidance by God. Not getting the Texas Children’s job was a gut punch, but certainly I can say that that was not the opportunity God wanted for me, I think. But what is the opportunity and what is the most trustful approach to waiting for God to reveal another opportunity? Oh the questions. And this is the struggle of unemployment for many I’m sure. Just the thought for me of a long unemployment period is scary, depressing, solemn, and lonely- helpless really. For many, the thought of unemployment and the possibility of a long unemployment adds to the frustration, helplessness, loss of self esteem, and even hopelessness. It is a very cruel experience. It beats you down and can make you feel worthless. It is scary and fear inducing because of all the possibilities of not paying student loans, defaulting on a car loan, not living in a nice place, depending on others, feeling humiliated, etc. But it is one that can be a learning experience. I want it to be a learning experience, but I want it to be a short one. But I also want it to be a time that I grow closer to God, somehow, in someway. Perhaps that is my learning experience. Perhaps it will be learning how to be supported by others. I don’t know. But I want to make even this experience meaningful, rather than simply about dollar signs- but that is hard, and for me (not the impetus for everyone I know) that meaningful experience starts with God. I was just with a good friend, Ryan Sturgis, a mighty good man (he brought me a fall pumpkin beer!) in my fair opinion, at a mighty good breakfast restaurant called the Breakfast Klub in Menifee, CA. As our conversation rounded many angles and as we described my weight loss over the past three years and his college career and desire to do speech therapy, we came to a close and when the server brought out the check, had the normal discussion about who would pay for the meal in some heated (not really heated) terms. And then he said this: “whenever someone tries to do something nice for me, I am learning not to reject it. It is a way for them to love me.” Which he then followed up by saying that he would let me pay (ha!). But the truth of his statement rang true for me. When someone tries to offer kindness, we are the better for accepting it, even if it is something as simple as paying for a meal or offering to help with dishes. Why? This is what has stuck with me since that morning and insight with Ryan. Because when someone offers to do something nice or offer a kindness to us, it is a visible means of extending their love to us. It is a way of offering love. It is a way of telling us they love and care for us. In other words, it is a love language that allows them to find meaning and feel meaningful. This is a critical way to grow a community. People need to learn to love, to practice loving each other and feeling welcomed and a part of the community. Thus, we are the better for accepting it, because it is a practice for us to be loved and allowing them to love. Taking the opportunity away from an elderly man to buy my lunch after church acts as declining his love and allowing him to love others less. This is one of my issues. I love to be independent and love to feel like I have enough to do things for others. But I have a really hard time allowing others to offer kindness to me. I live with an elderly man who for a whole year insisted on buying the meal every time we ever went out. He insisted on buying every tank of gas when he was ever in the car, even if none of the gas went towards something he did- in fact, he would pull out his card from his shirt pocket and not even say a word as though I was supposed to use his card at the gas station. His family understood this and his grandson actually shared that with me shortly after I moved in. But I was still not good throughout the year of accepting his kindness. At times, I felt like the kindness was obligatory and at other times, I felt it belittling. But as I reflect on that experience, the reason it felt obligatory and/or belittling was because I didn’t want to be loved- I wanted to do all the loving. I don’t like being the object of love because that makes it seem like I am need and don’t have. In essence, I didn’t want to be loved because I didn’t want a perception or to feel poor and needy, which was a very poor excuse because the focus was on me and stayed on me and my avoidance of reality. And it also showed a bias against the label of poor and needy, which is another issue altogether. But the point is, I didn’t often accept the love. My parents always had trouble with it too and avoid someone else ever paying for dinner or making dinner for them and my dad with well good intentions often rejects help in the kitchen after a meal. They often reject love too. Many of the people I know have trouble with it. I must do better at it because as human beings, we must practice being loved. We have to practice accepting love in all its forms- gifts, words, actions, arts, relationships and surprises. How can we ever develop deep and hearty friendships if we aren’t practicing being loved? How can we ever learn to trust in others when life gets chaotic, confusing, painful and full of loss if we don’t practice being loved with the small things? When our lives fall apart, how can we turn to others if we don’t practice being loved? How can we even begin to call ourselves church if we don’t practice being loved? But their is a very important layer to this I haven’t touched on. The reason we practice being loved is because God has given us a truly good gift that requires receiving too. God has given us numerous gifts for that matter- he has given us creation to watch and observe and admire, he has given us males and females to appreciate beauty, he has given us food and drinks that are amazingly tasty and good, he has given us different cultures and people that make us look beyond ourselves, he has given us good family (some of us) , he has given us shelters (some of us), and he has given us friendships. He also gave us a chance at a superlative relationship with him, full of peace and joy and justice and compassion that is with us every day and at every moment, even in crisis. He gave us his son who became one of us and lived beautifully so we can follow. He gave us forgiveness, sacrifice, freedom from sin, reconciliation, peace- all through the love of his Son. That requires faith, and it requires us to receive it. It is all love that needs us to receive and be grateful. Thus, we practice being loved in all the small things in life- we discipline ourselves to both give AND receive love because the greatest love we know if something we receive, and that doesn’t come easy. Grace and love are not easy to receive, especially considering how hard it is just to receive a free meal from a friend or an old man. 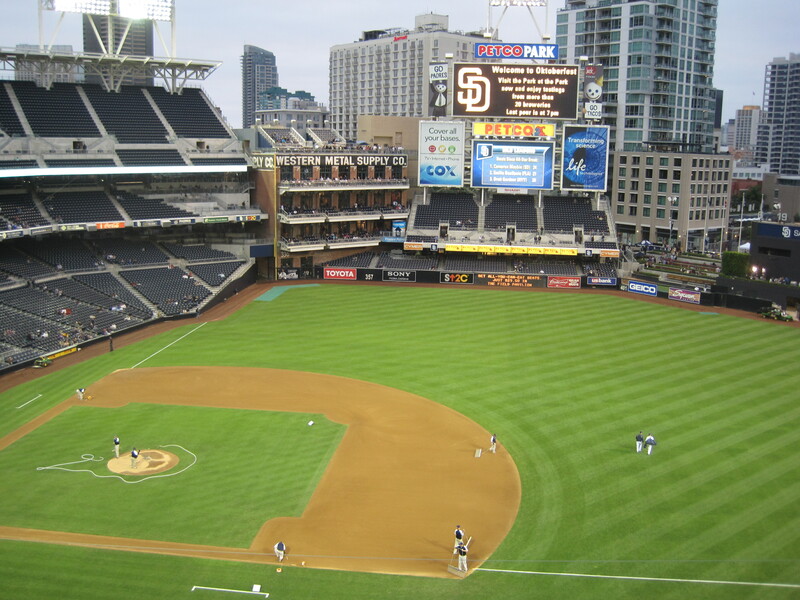 So, as I pursue my bucket list here and there, I got to go to the San Diego Padres v. Arizona Diamondbacks game last night and it was really fun and a great time. The stadium is beautiful- good atmosphere, clean, close to the action, open and few walls, an ocean breeze and smell. The Padres were hosting an awesome Oktoberfest night at the stadium and the food was actually pretty decent. My brother had a BBQ brisket sandwich that he is still raving about. I had a “Slugger Dog” that was huge and very tasty, with jalapeno’s, onions, and mustard. The seats were great seats right down on field level and two balls actually made their way our way during the game- oh so close. 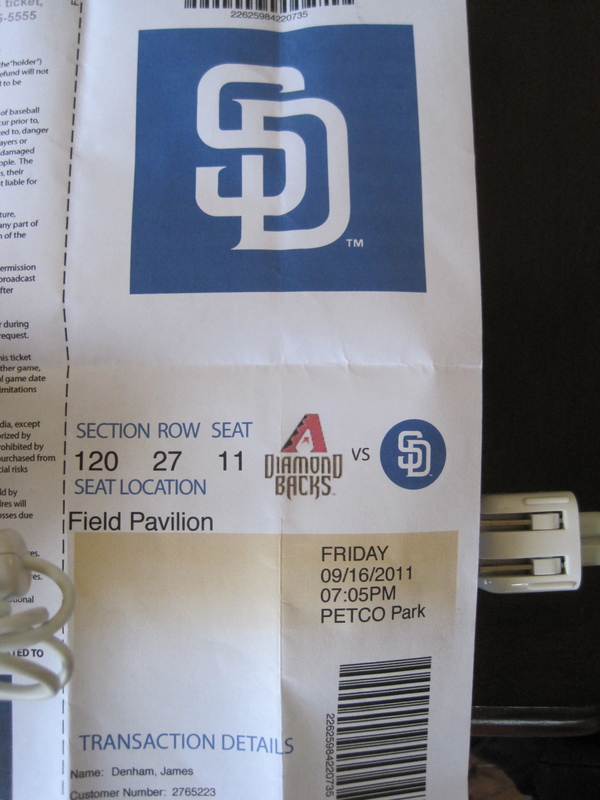 The game was wonderful and as it turns out, I think very highly of Petco Park and the Padre’s game experience. But here is what I thought was very cool. My brother and I actually got there two hours early and watched batting practice from left field. The experience of watching players spray the ball around the field, hit home runs into the upper deck off of batting practice 60 mph pitches, pitchers lounge around playing catch and catching the batting practice flies like little kids- that experience is priceless. There is something about that experience. In fact, for me it is an almost magical experience. As a kid, I love playing catch- the game itself is not nearly as fun as the “batting practice” experience. Just being there made me want to go get my glove. It reminded me that I love baseball, I love the experience and the magic of playing hit and catch and watching others play too. It makes me want to get on the field, or just get on a field, and be a kid again playing baseball in the field by my house. It is a sound of my summers from the past, and one that I absolutely prize. 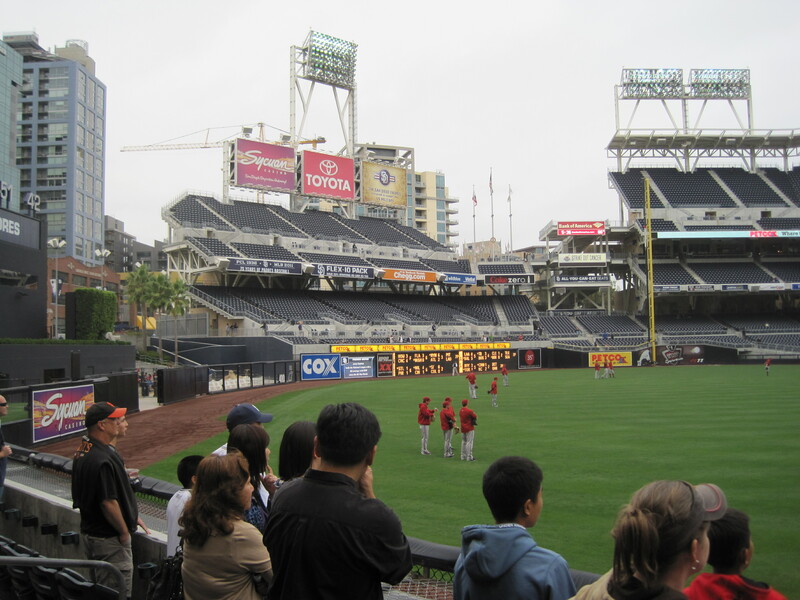 Thank you to Petco park and the Padres for a great experience at a great ballpark. Now, only 25 more ballparks to get to. 1. My family doesn’t often finish sentences in conversation. We, including myself, leave sentences without final nouns or verbs, and somehow, we still understand (at least we pretend!) what the others say. 2. My dad told me that when he makes fried chicken, he uses water (not…egg…mix?) to wet the chicken for bread crumbs to stay on. He seemed intrigued that one would use an egg mixture. 4. A look over our kitchen counter at my parents house: Hawaiian bread, Mike & Ike’s, chocolate chip cookies, fudge brownie mix, bags of chips, trail mix, multi flavored candy canes, and gifted to us sweet breadsticks. Actual food for meals, almost absent. But don’t worry, when that major earthquake comes, everyone else will be eating those Ready to Eat meals and hot oats they have been saving. But my family, we will be the ones pulling out M & M’s to keep surviving while snacking on brownies. Amen! 5. We have three and a half sheds in the backyard. Anyway, I think as I watch my family I see plenty of description for every family system. We live and work with certain rules and ways of interacting (one of ours in not finishing sentences, one of yours may be greeting each other with a smile every time, etc…) and we learn to get what we need by playing the game with each of our family members. It is not bad, because each family comes out to be distinct and unique and strange in and of themselves. Not one family escapes the madness. And we learn to let each of the family have their uniquity. We try not to change as much as possible but we try to change each other all the time. Even though consciously I know that I tend to try to fix things in my family and try not to, when I am at home I seem to do it all the time and that’s because we have our roles, some more comical than others. But each family is unique and strange and intriguing. Some are really dysfunctional and unhealthy, but mine, I have to confess, is not unhealthy. We just have our own way of acting out what many families have and share: love. We do love our own way. And that’s just fine with me. Thank God for our family. And really that is the important point of it all anyway. Our families are a key place where we learn about God, about human beings, and about being virtuous, good, faithful people. If my family wasn’t so strange, how would I practice learning patience? If I wasn’t so darn stubborn, how would my family practice kindness? If we always got along so well, how would we practice learning how to forgive and be forgiven? If we were alone, without the family, where would we learn what good dependence is- learning to be interdependent on family helps us learn to depend on God. If I didn’t have a father and mother, how would I learn about the different fatherly and motherly attributes about God? For that matter, those who grow up without good parents need community all the more to help reflect and develop those attributes too! You see, the family, both immediate and extended, are the grounds for learning about mercy, kindness, love, joy, peace, patience, forgiveness, compassion, justice (my brothers know oh so much about acting justly towards all siblings…!) and about God. Now that is grounds to thank God for family and for their strangeness. And that is why I have the family I do. Can I say I loved the President’s speech without being called a socialist or a sad and pathetic human being who puts politics ahead of common workers? I really did like the speech. When I think of leaders, leaders have to have a fire and a potential to express hope and urgency when needed, even if they won’t have silver bullets. When I think of a leader, I think of someone who can compromise on some things and speaks out of his vision. I think he did that. I appreciate that he spoke with passion and urgency. I appreciate that he picked out things that Republicans and Democrats have supported and worked on. I appreciate that he acknowledged that he and others aren’t looking for a silver bullet. I appreciate that he acknowledged with passion the differing opinions about government role such as cutting taxes and clearing government red tape on one side and spending and programs on the other. I appreciate that the President focused on aspects of our economy that I feel passionate about: infrastructure and teachers. Between construction and education, we have a lot of blue collar high quality people. And I appreciate that the President’s plan was not simply raising taxes- although Bill O’Reilly after would have me believe that raising taxes was the greatest part of the plan. Part of the plan that I heard was about tax cuts and raising taxes, hiring teachers and veterans- and I don’t really care that we may not have an equal amount of spending cuts for that, I think we require and need to hire those people. This response saddened me. It frustrated and angered me. In spite of the hope that being reminded of the image of God in another would renew our sense of peace and compassion towards the other. And then after watching the President’s speech, which I felt was lighting a fire under everyone, I watched as the first response from Wolf Blitzer was that the President threatened the Republicans. That was not the point, and it set up and created the natural response point for talk- the divisiveness and political hatred rather than the vision and hope the President laid down about a country that is still full of good people, full of hard work, and full of strength. And then to top it off, I watched 15 minutes of Bill O’Reilly who spoke with Lou Dobbs. O’Reilly said that the President was playing politics by putting the Republicans in a spot where if they passed the plan, they would be seen as agreeing to those plans, and if they didn’t vote for it they could be held to the fire as not wanting to help workers. My first response was that any group that puts together a plan is doing that to all the others, and that is good- it forces action and if they don’t vote for it they can state their excellent reasons (that is part of humane dialogue right). He also responded to the speech by saying it was a charade because all the President wants to do is raise taxes and that’s all the speech was about. Now he did think some things were good but in calling it a charade and that the President really just put politics over the working person by putting the Republicans in a bind…really? Really? Does that really help us grow and gain steam in our country when the country is as bitterly divided as Washington politicians? Calling something a charade? It may be misguided or not effective, but it isn’t a charade. I am not a Republican fan, but I don’t call them out as charades. There are such things as charades, but not as individuals- the parties as a whole may charade, the country as a whole may charade, the Congress may charade, but to call the President charading? I felt disgusted and saddened because it reflected my belief that even after a pretty good speech with good things (hiring veterans and teachers, tax breaks for small businesses, closing tax loopholes) that might really do something small that will encourage more (remember, no silver bullets), the speech may end up going nowhere and only bickering and blaming will result. This is what I lament. That when good things are said, they are bypassed for divide. That when small issues like scheduling come up (ala Republican debate and President’s speech), people from all over make a giant issue out of it. That when we have an opportunity to state the best of what we see and give compassionate feedback, we ignore the positives and call others sad and pathetic and charaders or blame the left or the right for our problems. That when we have the opportunity to see the image of God in each other and trying to work for the better in our country, we see each other as sad and pathetic and blind and get set in so that the other can’t “win”, do anything so that the other side can’t claim any victory. I lament this. It is frustrating, but ultimately, I lament our situation because we need better, and it surely starts with me. It starts with all of us, including the President, the Congress, Bill O’Reilly and all those others in the Facebook posts. It starts with to be compassionate and seek to be helpful as we can, and to work for the greater good as Americans who still value what each can bring to the table. So, I have been home now for 3 days and it has been full of excitement and play and little relaxation, but that is coming too. The first day I came back I made butterscotch cookies and my aunt and uncle came over, and we got to play Ticket to Ride, and I won. Now, I love that game and thoroughly enjoyed playing- and of course winning. I always seem to play that game really well. I love those types of strategy games and I seem to always be quite tactical. The next day, Saturday, I got to enjoy 9 holes of golf at a par 3 course, even though I didn’t putt or chip well- but my tee shots were good looking golf shots! Played with my uncle and cousin and two brothers. Then later, got to have a decent dinner and played the Wii golf with my brother Joe as well as a rousing game of Phase 10 with my family after dinner. It was a very good day. Noticed that my dad never really inflicts pain on others in games. My mom is not competitive. Joe is fun to hang around and play with. But Phase 10 can be slow as beans! Sunday went off well. I ran in the morning for 2.5 miles. I then went to church with my parents. Their church is interesting because they don’t use women’s gifts to pray or lead communion, and they don’t even let little girls walk up the aisles to collect attendance cards. They are sweet people I’m sure, but it just seems like they are stuck trying to be the old school Church of Christ in a world that has moved towards a healthier understanding of community and church. The hymns were really good and worshipful, and they always do a faithful and incredible job providing translation of the music, announcements and sermon in sign language. But I do wonder about their direction as I would with most churches- just two elders? no women serving? youth ministry kind of stuck? Anyway, my thoughts are always there if you want to know more. But I digress. My Sunday went on with grilling lunch chicken kebabs with summer squash, onions, and bell peppers and then having dinner banana splits made at home. Plus, I got to play most of the day with Will, my nephew, who is hilarious. I got to swim and watch TV and spin with him, and also got to swim with cousins Ryan and Rhea. Then all sorts of family were present later in the evening when I got going on my perhaps best skill- ping pong. I just dominated ping pong and like a champion boxer, was 31-1 all night long and played really really well. I love that game because I am really skilled in slamming and in spinning, and just have a good diversity of styles in ping pong. Kind of reminded me of the movie Balls of Fury…a little. Anyway, poor uncle Mike and friends went home depressed that they couldn’t beat me. I am just loving home right now – lots of family and good food. Sets up good for Labor Day tomorrow! Leave a comment Love coming home!